The post was edited 1 time, last by Zagadka ( Mar 11th 2016 ). To answer you first question, you can change the resolution in the PSWG launcher settings. Secondly, the game doesn't have any combat ATM, so there is currently no skills to use. Hope that helps. Ah, thanks, I figutered that might be the case. My problem is that when I set resolution to 1920x1080, the interface elements end up being very tiny. I'm in the same boat, I've got the same resolution. I run at 1920X1080 resolution too but my interface size seems perfectly okay. Not sure what's happening there with you guys? I don't think I have done anything to change it's default size. 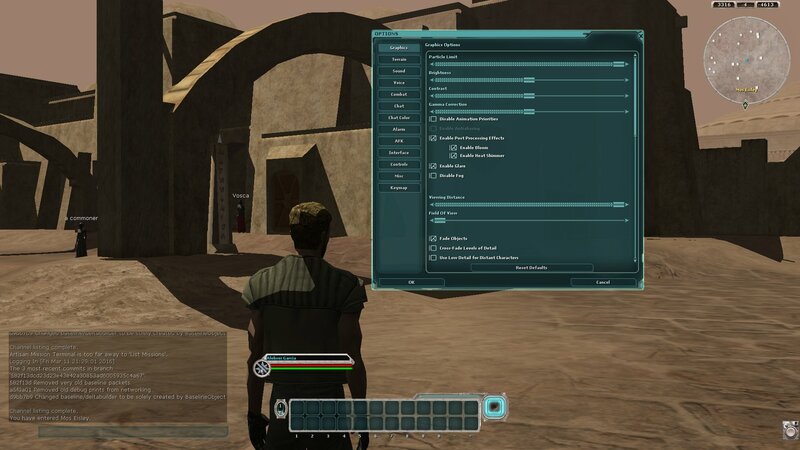 What is interesting is that you can resize the map element by dragging, but not other parts of SWG's famously user-friendly UI. Welcome to the SWG emulation community! is there a way to change the UI size as a whole? I don't think you can do this without changing the resolution at which the game is played. Maybe some UI mod could do the trick. I am unaware if such a mod exists, though. Combat abilities have not been implemented yet. Same for me too, I'm running the same resolution and it fits the screen perfect. Welcome aboard! Not much to do but run around explore! Regardless, once the game goes live, you'll have a great time with other players.